Cannon County General Sessions Judge Susan Melton, right, administers the oath of office to new Assistant District Attorney Nathan Nichols Thursday at the Cannon County Courthouse. 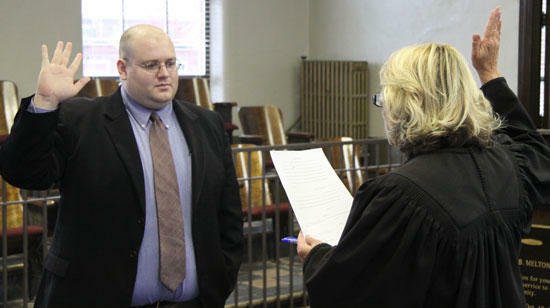 Newly appointed Assistant District Attorney General Nathan S. Nichols was administered the oath of office by Cannon County General Sessions Judge Susan Melton on Thursday. He was named to the post by District Attorney General William C. Whitesell, Jr. after passing the Tennessee Bar Exam last month. Nichols, a resident of Cannon County, received his Juris Doctorate from Nashville School of Law and was awarded his Bachelor of Arts degree in English from Middle Tennessee State University. He has been employed as a criminal investigator with the district attorney’s office since July of this year and, prior to that, worked in Cannon County as a deputy circuit court clerk. Nichols served during the administrations of both former Circuit Court Clerk Robert H. “Hoppy” Davenport and current Circuit Court Clerk Lynne D. Foster. He also represented the First District as a member of the Cannon County Commission from 2006-2010. Nathan is the son of Mike and Vicky Glassmeyer of the Sunny Slope Community and the grandson of the late James Youree Nichols of Readyville and Ron and Anna Ryan of Murfreesboro. Nichols will prosecute crimes in Rutherford County Circuit Court. Congratulations Nathan. You've worked hard to accomplish this and are a well deserving individual. Good luck.